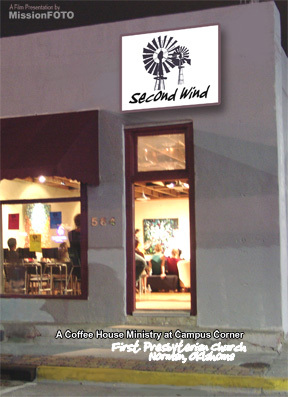 During the summer of 2007, First Presbyterian Church (FPC) of Norman called once again asking us to come to Norman to begin work on a promo piece for a new FPC campus ministry called Second Wind. The University Class at the church had taken over a small commercial building the church had purchased some years before and began converting the space into a ministry to the campus of Oklahoma University offering free live concerts and coffee. Additional funds were needed to purchase espresso makers, cabinetry, a commercial kitchen remodel and install code bathroom facilities. Three days were spent in Norman with the students and church officials taping the film.